A kitchen remodeling project can be a major endeavor. 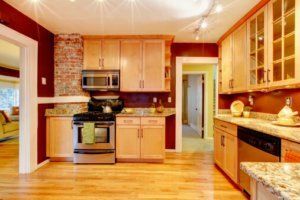 Even jobs that start out as a “minor makeover” often have a way of evolving into a much larger task as the homeowner realizes there are other changes or upgrades they would like to make. And this can be a smart move, as it is usually more efficient and budget-friendly to tackle these plans all at once, as opposed to doing them one at a time individually later on. Not to mention, you get all of the hassle and inconvenience out of the way quickly in one sweep, instead of dealing with the prospect of a series of ongoing projects. Still, there are some downsides to a kitchen renovation that grows beyond the initial plan. As the scope of the project expands, so can the stress level. At least, if you don’t take careful steps to keep potential issues in check. And this can quickly cause what you initially envisioned as a quick and simple “piece of cake” project to escalate into a big, seemingly endless succession of challenging decisions and painful headaches. Plus, as the size of a remodeling job grows, so does the budget—including many little steps along the way where missteps or hasty decisions can prove to be costly or can cause wasted spending. The good news is, even a kitchen remodeling project that has transformed from small to sizable can be manageable if handled properly right from the start. The most important decision is obviously to pick the right home improvement contractor. A professional contractor with extensive experience in this area will likely be accustomed to the nature of these types of projects to evolve and expand in scope, and they should be flexible enough to adjust as your plans change. This doesn’t mean that you can make a drastic change suddenly in the middle of work being performed. Ideally, you and your contractor will sit down for a detailed brainstorming session before the job begins, at which time your true hopes and visions for this space will be revealed. That way, you can incorporate the full vision of the project into the initial plan, allowing for everything to be settled in advance. While there is of course no completely surefire way to guarantee that your home renovation project will be totally free or any hiccups or unexpected pitfalls, you can increase the odds of a smooth and stress-free experience by taking the time to plan carefully, anticipate potential challenges and come up with solutions. Ready to get started on your Phoenix kitchen remodeling project? Contact RW Remodeling today!